I mean, is there a reason why I keep having to hear fu**ing “Purple Rain” everywhere? Ok, I’ll give it this. It made for a FABULOUS New Yorker cover. 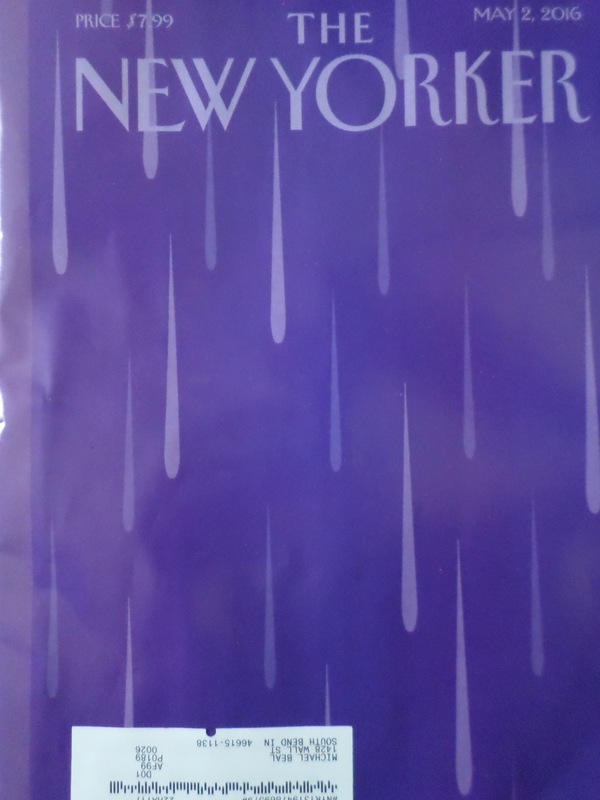 Not a good New Yorker cover, not a great New Yorker cover, a FABULOUS New Yorker cover. But as ever, it is a great, great time to separate music from aesthetics, something the public doesn’t always have a great time doing, hence the popularity of Britney Spears. Just yesterday I saw the second smart-a** joker mashing up “All Star” by Smash Mouth in some bizarre way, trying to be funny (likely typifying a certain fear before the precipice reality of actually genuinely LIKING the song, of course). If you ask me, this is sort of what “Purple Rain” is. At least, it used to be. I used to hear the funniest sh** on the bus out in Colorado. One time this homeless dude traveling with his buddy was like “I’m bi and he’s gay, we are down for some sh**!” And then this other time this drunk dude started singing “Purple Rain,” and his buddy started cracking up. But I mean that’s what it is: it’s overly dramatic. Not that Prince wasn’t usually over-dramatic. He got away with it by way of overwhelming originality. But “Purple Rain” definitely isn’t his most ORIGINAL song — I mean think about it, when Prince first burst on to the scene, what was the trademark he provided to the industry? Was it ballads? He** no, it was that fast urban pop with the frenetic guitar strums, the meanness, the personality, and also the grim depictions of street life in the Midwest a la “Sign o’ the Times,” et. al. But do we want to hear him SAD? Why do we always have to hear him SAD, when “Diamonds and Pearls” is so brilliant and glorious, when “When Doves Cry” is so rhythmic and defiant (and yeah a bit sad, sorry I kinda botched that one). Anyway, let’s see what the public thinks.